Pharma Franchise For Nutraceuticals Medicines – Innovexia Life Sciences is a reputed ISO 9001:2008 Nutraceuticals medicines and drugs Franchise in India. Our company has been appreciating part for thousands of doctors and medical professionals. We are offering pharma franchise for nutraceuticals medicines, products, drugs, and range in all the parts of India. The Food & Drug Administration (FDA) verified products are available at affordable prices. The quality of each product has been maintained high by the company. The nutraceuticals drugs have a huge demand in India. The market is growing enormously due to the high demand for dietary supplements, multi-vitamins etc that are prescribed by the doctors in abundance all over the globe. The pharma franchise for nutraceuticals medicines, products, drugs & range is the best way to start your business and entering the nutraceuticals drug market in India. 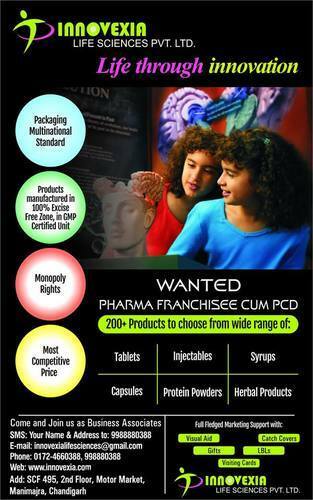 Innovexia Life Sciences offers you a genuine PCD Pharma Franchise Opportunity for investment. It can be exclusively availed in pan India. Looking forward to best deals in nutraceuticals drugs and medicines deals in India? Innovexia Life Sciences provides pharma franchise deals in all the parts of India at most affordable rates. if you want to know more about our deals, vacancy and exciting offers, call us at +91-9988-880-388 or 0172-4660388. You can also connect with us by writing an email at innovexialifesciences@gmail.com. We will contact you as soon as we know. What is The Scope Of Nutraceutical Medicines Franchise in India? The nutraceuticals market in India is an overwhelming one. The drugs and medicines provision market provide solution to many diseases and disorders. They have a high demand globally. India is the third largest populated country sharing a highly demanded nutraceuticals market. The global nutraceuticals market is said to be $204.8 billion in 2017. It is growing at an impressive rate of CAGR 6.3%. The Indian Pharma Industry has been greatly sub-divided into segments with mass demand. The nutraceuticals market segment holds one of the top places to have a good share of profits. The market is currently said to be an estimated value of USD 4 Billion which is equivalent to Rs. 26,764 crore as in 2020. The Drug Marketing and Manufacturing Association (DMMA) have said the market will be growing at a rapid rate of 16% in next 5 years. This shows the potential of nutraceuticals market in India making it a profitable affair for all. The medicines are certified by FSSAI and FDA. All the pharma drugs are verified and approved by DCGI in order to provide with your best formulations of nutraceuticals. Innovexia Life Sciences offers franchise deals which are affordable and genuine in all terms. The products are made in WHO and WHO verified manufactured units and plants. The manufacturing has been done under good QA and QC conditions strictly followed by the company. World-class Packaging technology is used. 100% and credible Extracts are used while manufacturing of nutraceuticals medicines. Attractive tools of promotional are being distributed regularly to our franchise clients. Affordable rates of nutraceuticals medicines of each dosage form. Name: Innovexia Life Science Pvt. Ltd.